In the event that there are aliens: What would they think about the current school system? And what could aliens and people learn from each other? Starting from an imaginary encounter with aliens students from a Welcome Class at the Alfred-Nobel-Schule developed a shadow play in the science fiction genre—an exercise in speculative thinking. On excursions to the Natural History Museum, the Museum of Things, and the Planetarium am Insulaner in Berlin the students collected image and audio material on the development of life on Earth and tested the suitability of the sites visited as potential learning environments. Drawing inspiration from the early film theatre of Georges Méliès, who invented the stop motion technique at the beginning of the 20th century, the researchers compiled a fictional travel report using their findings—from the perspective of aliens. 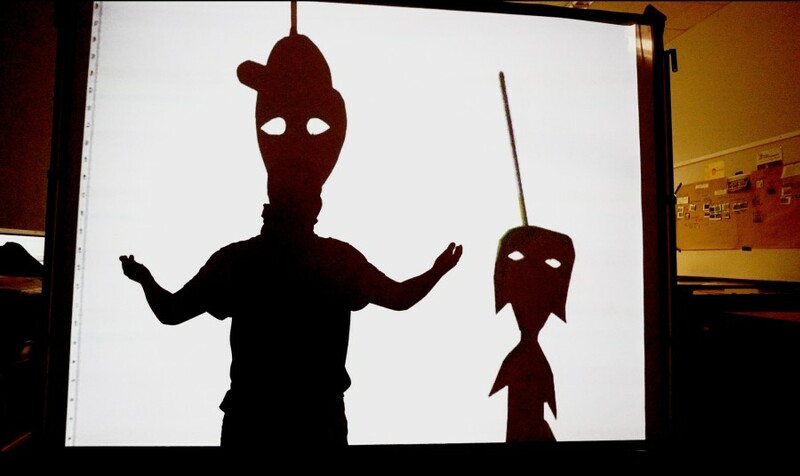 A projector enlarged small silhouette figures so that human actors could interact with them at eye level, making the strange appear familiar. Isabell Spengler is a film maker working at the interface between film and performance. In collaborative projects she develops concepts and experiments in which visual ideas are transformed into filmic structures with the aid of photography, drawing, performance, costume design, and model building. She studied under Valie Export and Heinz Emigholz at the University of the Arts Berlin, as well as under James Benning at the California Institute of the Arts. She taught experimental film design at the University of the Arts Berlin (2004-2014), and has directed numerous workshops at art schools, amongst others at the Merz Academy in Stuttgart and the Nova Scotia College of Art & Design in Halifax, Canada.